Adam Klein was instead revealed to be the winner of its $1 million grand prize on Wednesday night's two-hour broadcast. Ken, a 33-year-old model from Denver, CO, and Hannah, a 24-year-old barista from West Hollywood, CA, both received zero votes to win in the season's final jury voting results. During an exclusive interview with Reality TV World on Thursday, Ken talked about his Survivor loss and overall experience. Below is the first half. Check back with us soon for more. 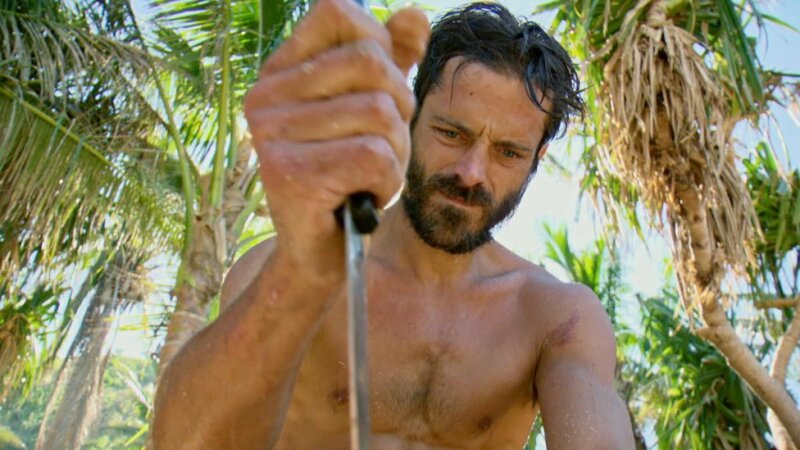 Reality TV World: What did you think your chances of winning were walking into that Final Tribal Council and then how did you feel leaving it once it was finished? Ken McNickle: Let's say, not very good, both times. That's the best way to put it speaking in words that my mother can read. Reality TV World: Are you surprised you didn't get at least one vote, like from Jessica Lewis or David Wright, especially? Do you think David was bitter? Ken McNickle: No, Dave and I were really close, and I talked to him quite a bit and I didn't feel like there was any resentment or bitterness [between] us. I'm surprised but I'm not surprised. Seeing how everybody connects at Ponderosa and how people communicate -- they have a lot of time on their hands and a lot of time to talk -- any time you get a group of people together, four ideas turns to three and then three turns to two. And before you know it, everybody is kind of on the same page. It's part of the social experience. Being human, everybody wants to connect and come together if you give people that long to sit there and talk about things. There are certain perceptions that were involved. I've had people come up to me from my season and say from watching the show, "I had no idea you were doing that! I had no idea this was going on. I had no idea you were a part of that." And it's one of the difficult things about coming in with a big bullseye and then doing everything in your power to try to hide that bullseye. And yeah, that's what happens. Reality TV World: So you think the result might've been different had the jury been able to watch the Survivor season unfold on TV before voting for a winner? Is that what you're saying? Ken McNickle: Absolutely. There was more of my work and Hannah's work that was shown. I think Hannah and I are also more humble people and so with that humility, you don't have the desire to stand up and shout from the mountain tops, "Look at me! Look what I did!" I think that humility and that humbleness, you know, people weren't aware of what we were doing because we weren't making everyone aware of them. It's not in our character, I think, to do so. Reality TV World: It seemed like you were getting frustrated with Adam at the Final Tribal during jury questioning, mainly because he was underestimating you. Could you tell me a little bit about that? Ken McNickle: Adam was a sharp guy and Adam likes Adam, and so he wanted to make it about him. I completely understand why. I understand what his motives were and what his direction was of what he was trying to show there. But, you know, I kind of went off on the guy afterwards. After [Chris Hammons]'s statement, you know, "Congratulations, Adam, on getting my million-dollar vote because anyone that can convince Ken to flip on Dave, you have my vote." And I looked over at [Adam], and I said, "Are you going to speak up?! Are you going to be honest? Are you going to let him know that you didn't do that?" And that's when I stood up and said, "Excuse me, I'm sorry, but no one had any -- ANY -- influence on me voting for David other than me. No one had that choice. No one pulled my strings. I wasn't a puppet for anyone. I chose to do that, and yeah, he wasn't willing to speak up on that. Reality TV World: Did you always plan to turn on David by the Final 4 knowing he'd be very tough to beat in the end, or was that more of a spontaneous decision because of the situation you were in? Ken McNickle: Some people are cutthroat in every aspect of life, every day, and they just leave behind a bloody trail of people behind them, whether it's business or relationships. But in life, there are other times when you can be admirable and have the best of intentions, but there are certain times in life when you're faced with difficult decisions. And I knew with Jess and Dave -- as I watched them grow throughout the season, especially Dave, coming out a stronger, more respected player -- I knew at some point I might be faced with a difficult decision. And that difficult decision would most likely be, at some point in time, possibly having to vote out Jess or Dave -- if they became too big of a threat, if they built that game resume up to the point that I would then have to look at it and say, "Okay, am I going to be able to beat you in the Final 3?" And both of them knew I wasn't playing for them. I've spoken with both of them and I am very close now with both of them, and they know why I was out there. It wasn't for them, it wasn't for my 15 minutes of fame, it wasn't for any of that stuff. I was out there for my daughter to improve our life. Reality TV World: Zeke Smith bluntly told you that you did nothing to evolve the game. I want to get your thoughts on that. Were you offended at all? Ken McNickle: Well, if you speak to people in the business world or you speak to people nowadays in 2016, there are all of these things that we have, you know, "fake it until you make it," or, "it's not personal, it's just business." And we've adopted this cultural acceptance around being not the greatest of human beings. "Oh! You screwed over 13 people this month?! You might've had some shady business deals, but hey, business is business and it's nothing personal." And I think people consider it an evolution, but I try to see it as the opposite. I kind of see it as a breaking down of the game. I love the idea of a group of 20 strangers going out into a physically-demanding, difficult space and having to physically survive -- emotionally, mentally and socially survive as well. But I think the game has pushed the physical aspect of the game so far out of the equation, as well as the actual survival aspect out of the equation, that people are pushing towards this hyperactive, unpredictable, super, you know, manipulative game. And in this game now, you don't earn respect for being a challenge beast. You don't earn respect for being physically dominant. You don't earn respect for being socially dominant. You don't earn respect for feeding people. I looked at a couple people and thought, "Really? So the dozens of fish and octopus and everything else you ate throughout the game doesn't hold any weight to you all? I should've just caught food for myself and cooked for myself and let you guys go hungry." And then we'll see who's actually there at the end of the game. And so, I think people think it's an evolution of the game because of this hyperactive, blindsiding -- and sometimes for the sake of blindsiding, it makes no sense. I honestly think it's kind of a breaking down of the game. Check back with Reality TV World soon for the concluding portion of our exclusive Survivor interview with Ken McNickle.